Do you think all those gears and spindles are too much for you to handle? Think again! Installation Tip: Use a pin punch or center punch (available almost everywhere including Lowes, Home Depot & Walmart) to tap gears, shafts and bushings for removal or installation. To avoid damage to the transport while tapping these parts, support the underside of transport frame with a several strips of wood in varying sizes (eg. 1"x1", 2"x2" and 2"x4") as needed. SERVICE TIP: This is a good time to clean the Release Bar Tabs. See Figure 3. Hub & Pin Assembly (Part #ATH604) with the pins pointing to the 3:00 oclock position. 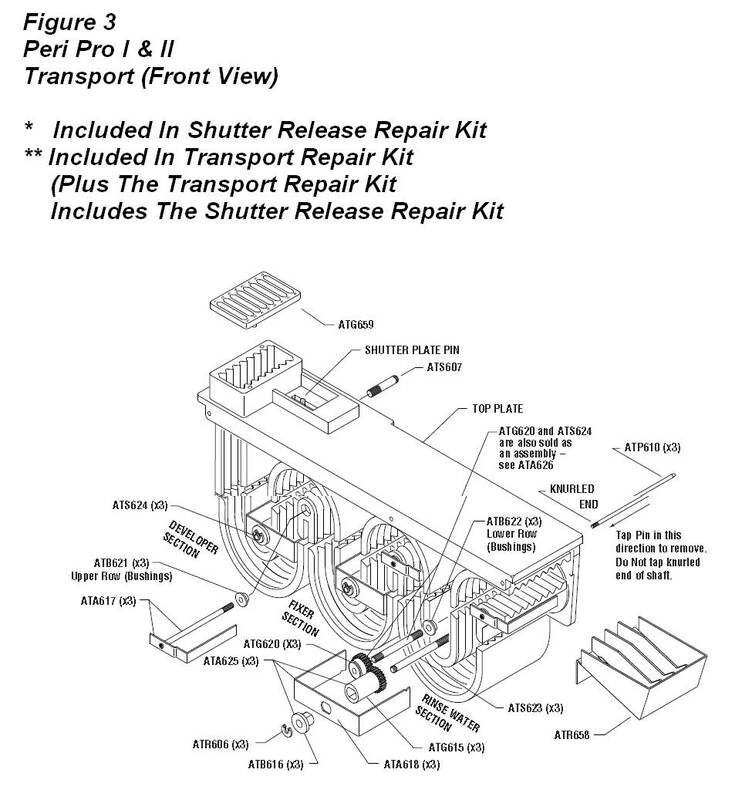 Replace the Rubber Bumper (Part #ATB609) which is used to dampen the Shutter Plate return  See Figure 3. 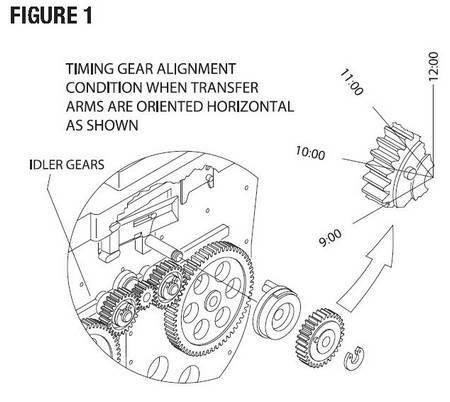 Replace the Shutter Return Spring (Part #ATS603)  See Figure 2. CAUTION: Do not over stretch the Shutter Return Spring during installation. Assembling the Top Plate, lay the Shutter Plate back onto the Top Plate using your finger, apply side pressure to Shutter Plate Pin to keep the Shutter Plate from falling out while aligning Top Plate holes to Transport holes. 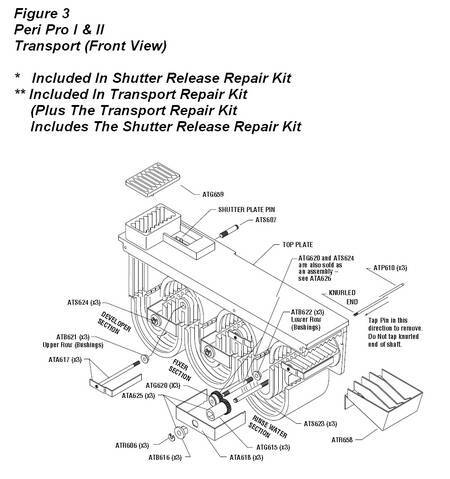 Ensure Shutter Plate operates freely before completely installing Top Plate Pins. Tap the Top Plate Pins in place one at a time  See Figure 2. 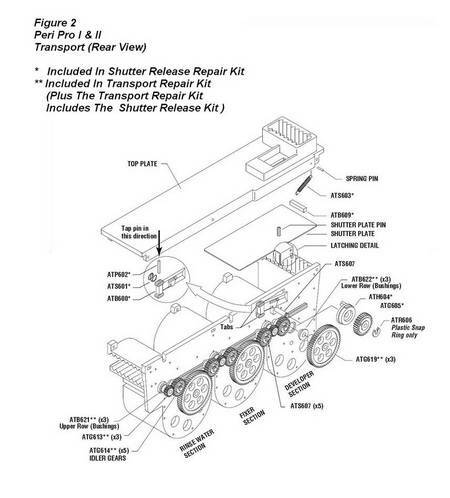 If you have already installed the Transport Repair Kit (Part #ATK629), then proceed to Step #9. If you do not have to install the Transport Repair Kit (Part #ATK629), then proceed to Step #9. 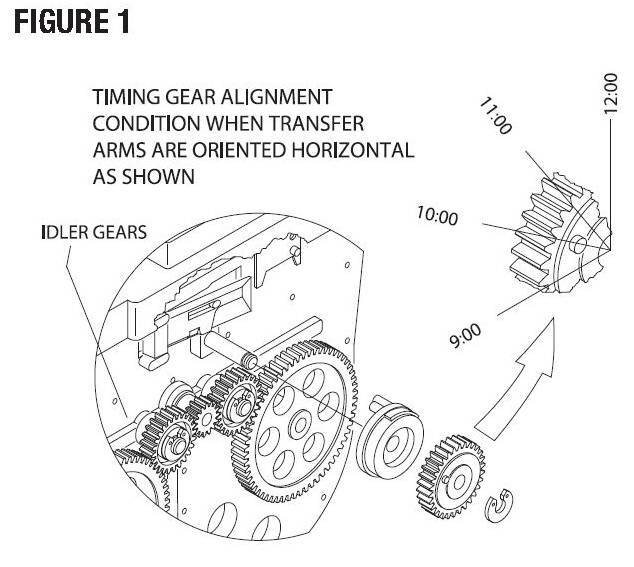 If all arms are in sync and in the horizontal position with each other (See Figure 2), but the raised molded dot on the Timer Gear (Part #ATG605) is not in correct 10:00 oclock timing position (See Figure 1), then remove the Plastic Snap Ring and slide the Timer Gear off of the shaft, then re-align the Timer Gear. Verify alignment and timing. If any section (RINSE WATER, FIXER or DEVELOPER ) or any part of a section is out of sync, but other sections are aligned and in time, then adjust only that section. Remove the Plastic Snap Ring and slide the Idler Gear off of the shaft from the same section, then re-align the Idler Gear. Verify alignment and timing. Check for normal operation as follows: Pull back on the Shutter Plate Pin and the latch should lock the Shutter Plate in place. Rotating the gears clockwise, the Hub & Pin Assembly will engage the Shutter Release Bar and the Shutter Plate will retract slightly. The film will then drop into the Transport and the Shutter Plate will spring forward to its resting position. The film will be transferred from the DEVELOPER to the FIXER and then to the WATER section of the processor without getting caught up by the transfer.